There are NO contemporary accounts of ANYONE spitting on soldiers when they came home. That is a meme that began AFTER the movie Rambo. A book written ABOUT this talking point says the author was NEVER able to find a SINGLE legitimate example of someone claiming first hand of them being spit on. This is a rightwing talking point and if it EVER happened it was NOT a widespread phonomena. That they left was anti military is something I also NEVER saw in the lefty groups I was in and I read a letter from a Vietnam Vet who THANKED a lefty group I knew for helping him get certain medical benefits he said he went to a bunch of rightwing groups and they ignored him then our group HELPED him getting in touch with his congressman and getting action on his benefits. The thing is propaganda in its most useful form is repetitively repeating meaningless but emotionally provocative things like I support the troops while doing nothing but SAYING it. They certainly don't vote to increase their pay or benefits like the left does. Saying you support the troops is a useless thing without the actions that show it. It is like saying I support the people of Nebraska. Good for you. WHO DOESN'T? This is why the right wraps itself in the flag and wears flag pins and does all the MEANINGLESS things while keeping their so called support to TALKING about it. Meanwhile everytime the rights support runs up against their HATE for poor and working class people they will throw the troops under the bus in a heartbeat. There are NO contemporary accounts of ANYONE spitting on soldiers when they came home. Although you can find many people claiming (today) that this behavior never happened, you can also find others claiming that it did (for example: Disrespect for Vietnam vets is fact, not fiction). I didn't actually see anyone spit upon, however I do remember seeing (in the news at that time) how vets were treated after Vietnam, and it wasn't good. Vets coming back from Vietnam were met by angry protesters. This 'meme', as you call it, far predates Rambo. But, whether actual spitting happened or didn't wasn't the point of my statement. I brought up the Vietnam War as the seminal event when liberals lost the patriotism issue to conservatives. In the public perception, this is where it all started. They certainly don't vote to increase their pay or benefits like the left does. Absolutely true. This doesn't go unnoticed, either. Republicans like to spend money on expensive weapon systems that keep their corporate supporters busy. They sell this as giving troops the weapons they need to succeed, which is partially true. But, when it comes to honoring commitments to retirement pay and healthcare, the R's (not all, but most) are completely unreliable. As a result, today's military is as politically diverse as the nation. I think the 'patriotism issue' is something that will mostly disappear when the Vietnam era folks die off. The reason it isn't going to help is because too many Americans are pathologically unable to accept or deal with criticism of any kind. I just told you my reasons and you ignored them so you could talk about how I dared to suggest we should be ashamed and how wrong it is. Well, it's how I feel. And I think a lot of others who should feel the same way but don't are the ones who have the problem. Like I said, I take issue with what the nation's identity is currently tied to, not with what it COULD be tied to. If it were tied to more constructive things, I would be proud. It isn't demeaning something to say you're disappointed with it, FFS. ... many Americans are pathologically unable to accept or deal with criticism of any kind. This part is absolutely true. But, that doesn't mean the constructive actions I suggested won't help. In fact, this aversion to criticism makes it even more important that we use carefully targeted criticism. Broad and confrontational statements, like saying you "feel ashamed of" (your words) your country, play right into the 'liberals hate America' narrative. Would it still get your point across to say something like "I love America, but we should not have invaded Iraq"? I'm suggesting that, when it comes to their country, liberals should throw blankets of love and darts of criticism; not the other way around. ...Broad and confrontational statements, like saying you "feel ashamed of" (your words) your country, play right into the 'liberals hate America' narrative. Would it still get your point across to say something like "I love America, but we ﻿sh﻿ould ﻿n﻿o﻿t have﻿ invaded Iraq"? Conservatives have successfully marketed patriotism as a trademark for many years. In some cases they have weaponized the term , (Joe McCarthy, ...."Love it, or Leave it",...etc). Is nationalism the new patriotism? If so, you can count me out. Loving America as a nation, country, or some vague nationalistic concept while the actual population, or citizenry as a whole, is loved, ...uhh perhaps not so much. Loving America as a diverse, inclusive group of people. The idea of "America First" exceptionalism, or infallibility, is loved perhaps not so much. Patriotism, (like many -isms), is in the eye of the beholder, and can be used to unite, or to divide. Things have changed a bit I think. 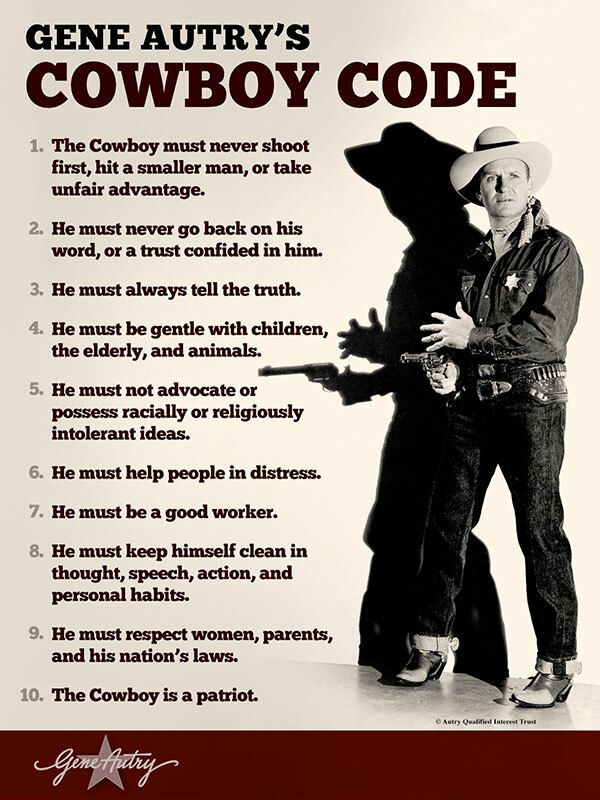 If numbers 1 thru 9 are embodied by number 10, then Gene Autry's definition of patriotism is a code of personal values, instead of loyalty to the state. When I was small, the top cowboy heroes in my little kid pantheon were Roy Rogers, Hopalong Cassidy and Gene Autry. I remember the spirit of this code if not the letter. And I guess I bought into it, in some way. I wonder if today's kids get the same impression from the new ring of superheros.
. But some blamed the war on the soldiers who had no say in it. in other words, the draft. It's not just about Iraq, though... it's about identity. The way to go after the socialist attack from the right, is go after it straight on with the truth, that there is not and never was any interest in socialism in this country. You are letting the right have it's own definition of socialism and every last one of them make up their own private definition of what socialism and communism is. It has it definition already, and if the prime tenet of socialism and communism isn't present it is not socialism or communism. Simply that their prime tenet of socialism/Communism is that the means of production is owned and operated by the state and that the sales of that production is also charged to the state. If that isn't present then it's not socialism or communism. Tell me the last time someone came up to you and said "you know I think it would be a good idea if the government owned and operated all business's" Don't be a idiot and play their game , if you do your simply supporting stupidity. Labeling things that are socialist that existed before socialism is stupid. Health care paid for by the government goes back to Rome, around the time of Christ. Giving money from the government to help the needy goes back even further then that. If it is a tenet of all government directions , it is then ridiculous to charge someone for being socialist if you support government helping the needy. It has it definition already, and if the prime tenet of socialism and communism isn't present it is not socialism or communism. Simply that their prime tenet of socialism/Communism is that the means of production is owned and operated by the state and that the sales of that production is also charged to the state. This describes state capitalism, not socialism and DEFINITELY not communism. I don't know how anyone could ever hope to explain the difference to a typical ignorant RWNJ... they hear the word 'capitalism' and think 'FREEDOM'. They're not even worth debating 98% of the time, because nothing will ever sink in. Noted, I did assume that, talking to a person on the left at least gives me the possibility to hear the truth ,the amazing part is what goofy crap that the right builds its case with.